In the summer of 2006, after the NPG Music Club closed, Prince started using 3121.com as his official website. Originally it was just a promo site for the 3121 album, but 3121 evolved in to more than just an album project. 3121 became a brand that Prince would use for at least another year and half during his residencies in Las Vegas and London, as well as his fragrance project. 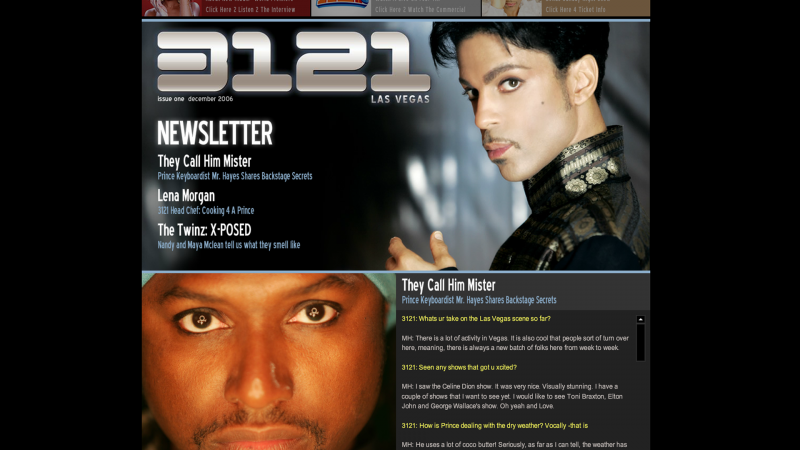 It was while Prince was performing in Vegas that he began to use the site as an online newsletter for all the activity going on during the residency. What direction were you given for the site? I spent a lot of time in Las Vegas helping Prince get ready for his 6 month residency at the Rio. He had tasked me with doing all the promotional artwork and branding around 3121 Las Vegas, and that wound up taking up all my time for a couple months. We started playing around with ideas down there like a 3121 newsletter, interviewing some of the people involved. We printed out a couple of issues and distributed them at the shows. So I was given the direction with this version of the site for it to be an extension of the newsletter. We featured the interviews and lots of photos from the shows to make it a fun companion to the Vegas experience. What was you favorite and your least favorite part of the site? I love Ash Warren’s great flash work. He really made my print layouts come to life online. But coming off of the NPG Music Club, we just weren’t pushing the limits like we used to. There was lots of talk about what the next phase would be, but ultimately it didn’t materialize. I would have liked to see more happen on 3121.com. He was losing interest in the online thing, but there was a ton we could have done with the Vegas experience. I would have made a stronger case if I had to do it all over again.